It’s only been a few days since my first wash with the Suave Professionals new shampoo and conditioner, Almond and Shea Butter. You guys have been asking so I’ve decided to give you the update a little earlier. Let’s get down to the nitty gritty. . .
Suave’s Claim: This moisturizing shampo is infused with 100% natural almond & shea butter, which are known for their rich emolients. It replenishes as it cleanses leaving your hair well-nourished & beautiful. My Results: I’m so glad it comes in a big bottle, because I love to apply a very generous amount on my hair just to make sure that it works. 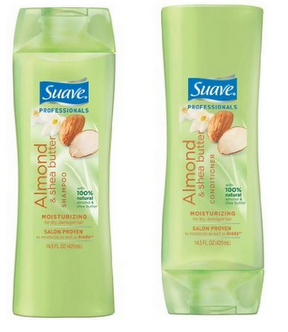 This was my first time using Suave on my natural hair and I like how it builds a good lather and washes my hair clean. Not to mention, I still smell the freshness of the almond and shea butter that they advertise to make wonders. Suggestions: I don’t recommend you use these products if you are doing a blow out or adding heat to your hair. I wore my hair for three days in a blow out where I did roll/tuck style and it was very dry. I don’t like having to add extra moisturizing creams that go against my daily spray. Although it’s only been a few days, the only great things I like about it was the price and the smell. Next time, I will do a deep conditioner with Free Your Mane’s conditioning mask to ensure a protection when I apply heat to my hair. I had pretty good results with this. I agree on your positives with the Shampoo. I probably won’t purchase that again, since I have other inexpensive favs that clean better and are more strengthening. BUT, I LOVE this conditioner. It’s great for co-washes, and sometimes I don’t rinse it completely out, so that it acts like a leave in. I’ve never tried to use it completely alone. I always use additional products after a wash & I don’t straighten my hair. But for me, it does waaaaayyyy more than I expected it to do. Love the smell, the moisture, cuts back on tangles, and keeps my hair soft for a more than reasonable price! I get a few spam comments and I just delete them and report them to spam. Not sure about plug ins but I know with the premium feature you can have it blocked from ads. Hope this helps!